During the winter months, your crockpot comes in handy more ways than one. 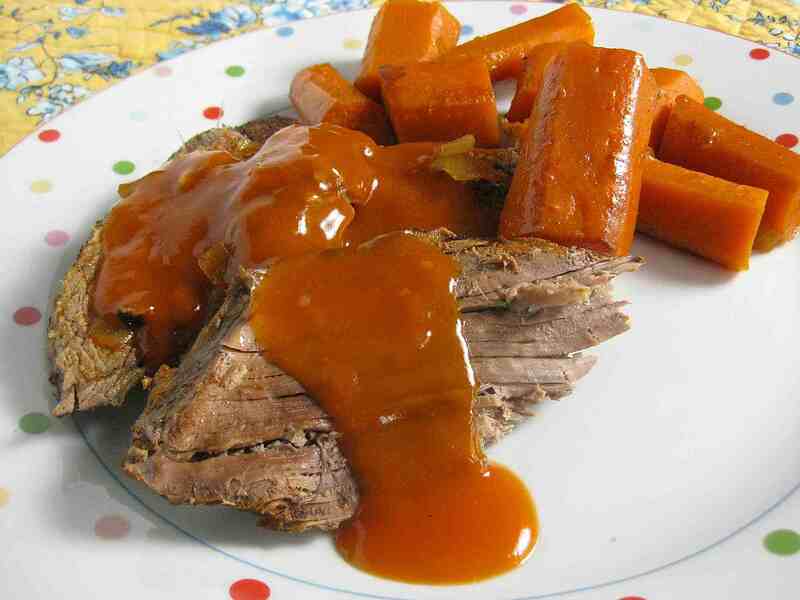 It's the perfect way to cook deeply flavored delicious comfort foods such as pot roast and casseroles. It fills the house with wonderful aromas that make you feel warm inside. And there's nothing like the feeling of knowing dinner is ready and waiting for you when you get home from work or school. These recipes are especially hearty and flavorful because they use winter foods such as potatoes, carrots, beef, and pork. Stews are perfect this time of year too. Enjoy these wonderful recipes all winter long. Making an entire dinner in one pot is what the slow cooker is all about. The flavors meld, blend, and infuse each ingredient so the whole is fabulously delicious. This recipe transforms an inexpensive cut of beef into a melting, tender, and flavorful meal your family will love. And it's so easy! This was one of the first recipes I ever posted at Busy Cooks. And it remains a favorite to this day. Just five ingredients transform ordinary boneless, skinless chicken breasts into a savory meal that's delicious served over pasta or rice. Or mashed potatoes! You can use any flavor cream soup (or bottled Alfredo sauce) you'd like, any type of cheese, and any vegetable. Mushrooms are delicious, but onions (and garlic too) are fabulous as well. Beef Stroganoff is a special meal. And this easy version is good enough for company. I always add a package of baby carrots to my stroganoff, but you can omit them or slice some carrots and throw them into the pot. This should be served over hot cooked egg noodles tossed with a bit of butter. For some real decadence, toss the hot noodles with some sour cream before you ladle on the rich Stroganoff. For St. Patrick's Day or any cold day, this meal is so good. Corned beef becomes meltingly tender cooked in the slow cooker. And the cabbage is added at the end of cooking time so it stays crisp-tender. Make sure to offer a couple of different types of mustard, or strain the cooking juices and serve as a dipping sauce. This is the recipe I turn to in the winter when I'm pressed for time and just want to throw some ingredients in the slow cooker and forget about it. All you have to do is cut up the chicken, garlic, and onion, mix everything up, slap on the lid, turn it on (don't forget this step!) and walk away. Add some sturdy veggies such as sliced carrots if you'd like. I love all kinds of chili But my favorite is unconventional. Because it uses wild rice! The rice adds lots of fiber and wonderful texture to this rich chili. Remember, you can flavor your food any way you like. If you love spicy foods, throw in a couple of minced jalapeno peppers. And make sure to taste your food before you serve it. The slow cooker tends to mute flavors, so you may need more chili powder. This old-fashioned recipe is a real winner. My mother used to make a recipe a lot like this, but she baked it in the oven. The pork chops become so tender they literally fall apart. And the flavor is superb; with only five ingredients! This rich and delicious recipe for chowder is perfect when a blizzard is raging outside. Keep the ingredients for this easy recipe on hand and you can make it whenever the mood strikes. I like making it with chicken, but it's equally delicious with ham, pork tenderloin, or meatballs. Yes, you can make Jambalaya in your crockpot. This elegant and easy recipe is full of flavor. Baby carrots, potatoes, garlic, and onions are roasted to perfection in this simple and elegant recipe.